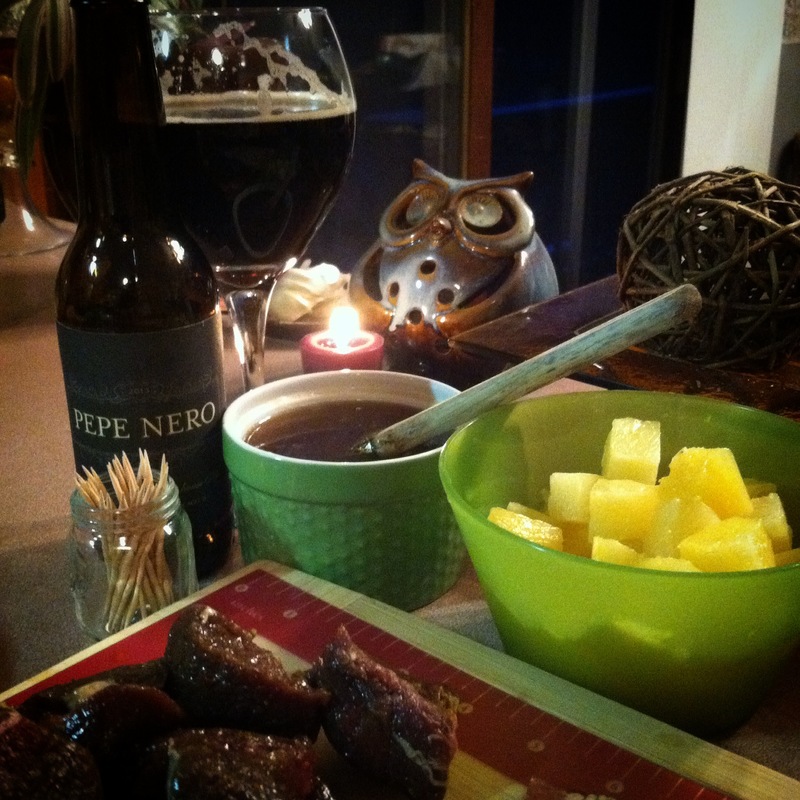 Take it from me, I could never bring myself to eat venison… I dont know what happened but something either my father or one of my uncles must have said when I was a little girl at my Pepere’s house warned me off from it. And honestly it was probably something along the lines of “Surprise, your eating Bambie!” or maybe when they tricked my sister and I into eating bear stew [I still dont know if that was a joke or was really what we were eating]… All I know is that I was a very impressionable kid and the rest was history. I will say though, once I finished making these sweet sweet little gifts from the angels above, it was as if the heavens opened up and the choir started singing me the songs of which angles weep in pure joy to. It was an epiphany of sorts really. On one hand, these little guys were the most juicy, clean, lean, fresh, and delicious form of steak that I have ever consumed! I mean, it seriously MELTED! 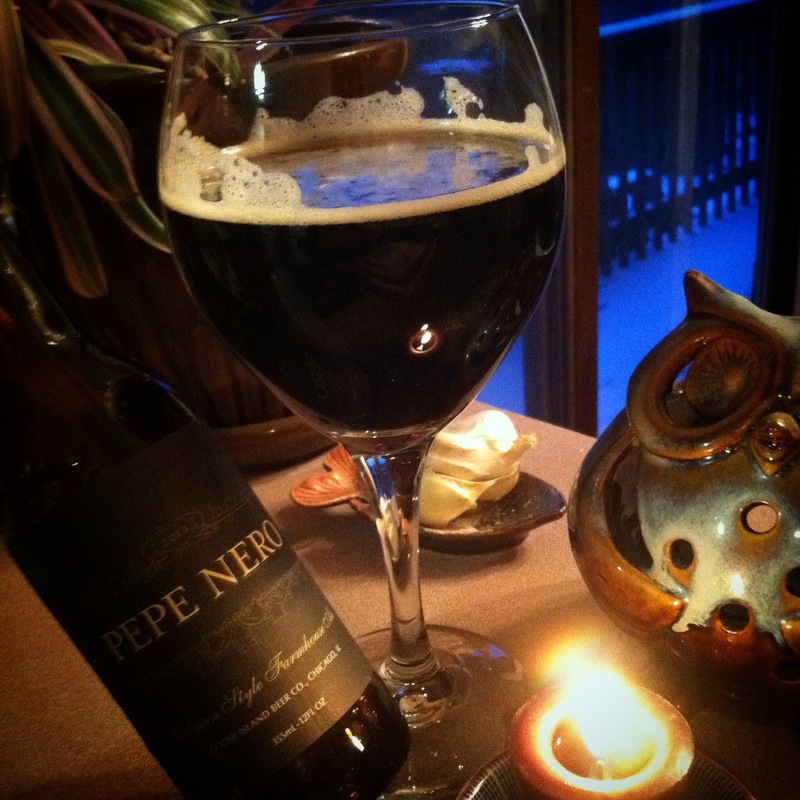 IT FREAKING MELTED IN MY MOUTH! I couldn’t believe that I once thought Filet Mignon to be the creme de la creme of all things steak… No…. venison now hold that title for me. But then on the other hand… I could believe that I had thought these sinful thoughts and betrayed my little deer friends from my woods here in the sticks! I mean, how dare I! They are so quiet, and majestic, and graceful… I love them with all of my being! Why must nature be so cruel! Needless to say, I am crazy for 1… and I love venison for 2… AND I am a traitor to my little majestic critters in the woods for 3! 4 Venison Steaks; cut into 1″ cubes and marinated in the above for 3-5 hours. After you have had your venison cubes marinating in its happy juice… discard the marinade and lay them out on some paper towels to absorb the excess juices. Combine 1/4 cup pineapple juice and 1/4 cup brown sugar and set aside. 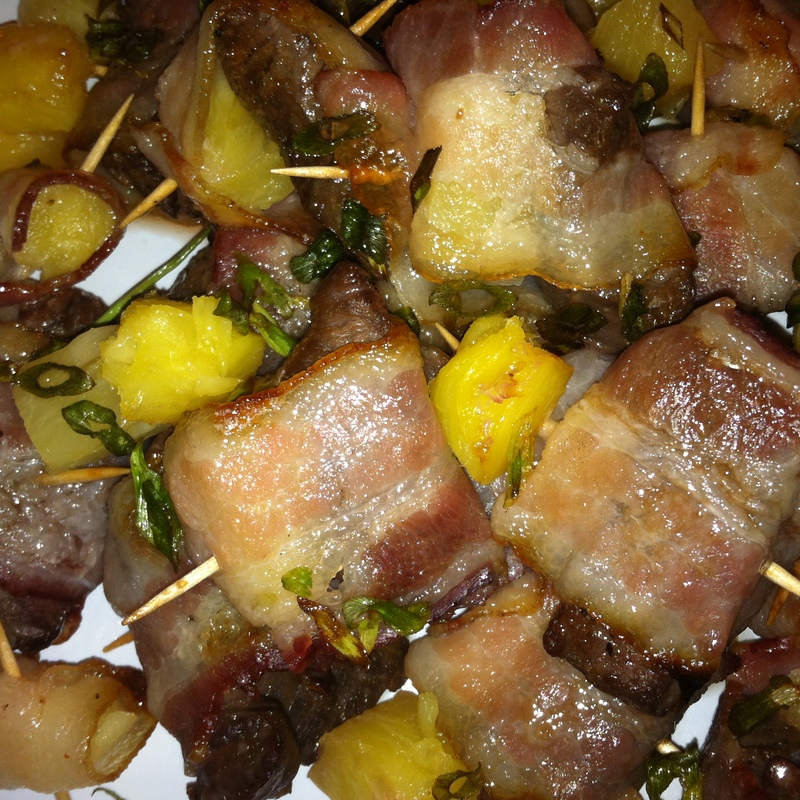 Create an assembly line of bacon, pineapple, pineapple-brown sugar glaze, venison, toothpicks, and drink! Next using your tried + true rusty BBQ brush, coat one side of the bacon strips before wrapping to ensure their happiness. 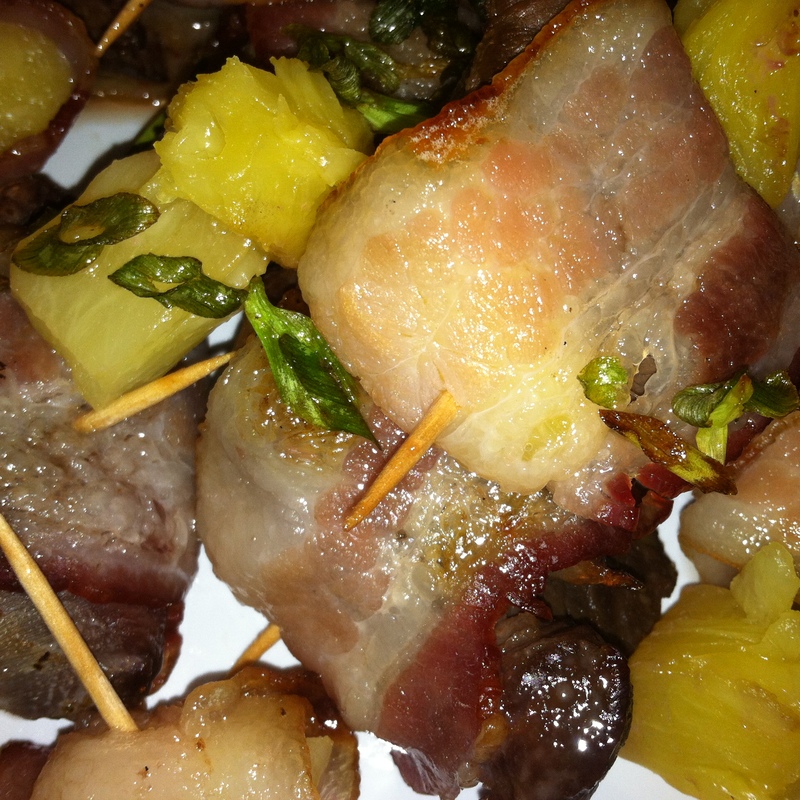 Once that is settled, place a piece of venison and pineapple in the center of the bacon strip and wrap it up securing with a toothpick. Lay your little soldiers out on a greased broiling pan. Scatter any remaining pineapple chunks about the pan because, waste not – want not! 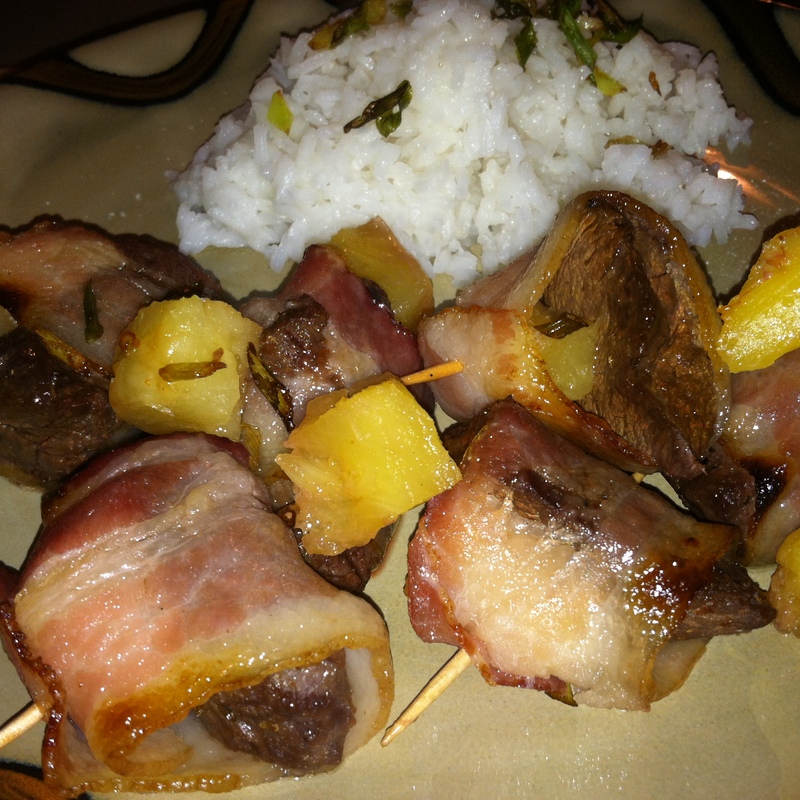 Plate your majestic Venison Bacon + Pineapple Bites and scatter the extra pineapples about the plate. Top with crispy scallions and enjoy!